This year I have several students that have just can't grasp the alphabet. They try their best and work their hardest. All year I have struggled to keep them interested in the materials and have continually made different types of materials for them to use and practice on. Each child learns a different way as we all know. Some learn visually others auditorily and then others need that kinethetic modality to learn materials best. So when I am teaching those topics that just can't seem to be mastered, I turn my attention to how I can modify the materials to make them just a little bit different and perhaps help even one more student learn that crucial skill. I think one of the best things I have learned in teaching is to take a step back and look at what you can change. What can I do differently that may give that student the "leg up" to learning this skill. Be flexible and willing to change how you present things. In special education you may end up presenting the same concept to the same child over several years and having a multitude of ways for them to practice it will be a lifesaver. Please click below and enjoy a trip to my TPT store where you can pick up today's FREEBIE for alphabet practice and matching upper and lowercase letters. 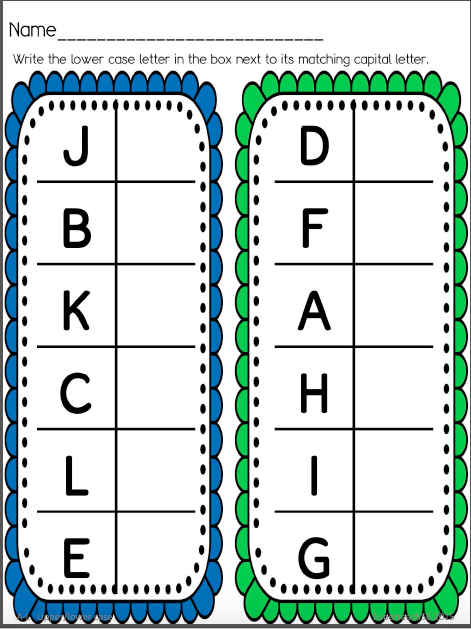 This FREEBIE includes the entire alphabet and also has black/white worksheets plus color sheets that can be cut apart to make activity cards. I hope you enjoy. Please leave feedback and check out the rest of the store. Great tip! Flexibility in special ed really is the key. I have a student who couldn't get the concept of making sets. I tried what felt like a million ways to teach it to him. The thing that clicked for him- having the PT doing it with motor built in. He slowly transferred it to the classroom then to the table with manipulatives. Yay! Thank you Traci! This is an awesome bloghop!